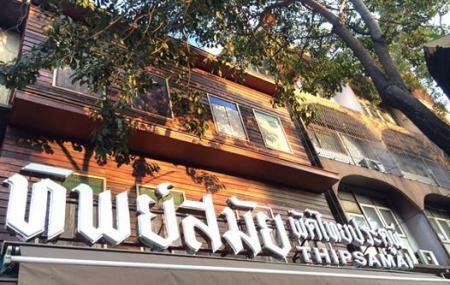 If you are looking forward to enjoying some Pad Thai Noodles in Bangkok, head out to Tipsamai. This place is believed to be serving the best pad Thai noodles in the entire city. The restaurant starts in the evening, and you will see chefs getting ready with their woks to makes some delicious noodles for you. The fire is kindled using charcoal, which only adds to the flavour of the food. A medium sized wok can fit in 10 – 15 plates full of noodles. The recipe usually begins with your choice of meat fried in oil, followed by handfuls of dry rice noodles. Sauces and seasoning is then added and eggs are cracked to make a perfect dish of noodle for you. Pad Thai Sen Jan Man Goong (Fried rice with shrimp) and Pad Thai Haw Kai Goong Sot (Fried shrimp with shrimp eggs) are the must try delicacies. How popular is Tip Samai? People normally club together Thunder Dome and Wat Pho Thong while planning their visit to Tip Samai. Worth the wait. Best Pad Thai we have ever had. Most popular option (pictured) is egg wrapped noodles with 2 pieces of shrimp. There are quite a few other options, but seems like most people go for this. Came for the noodles, but were impressed by the orange juice. Probably the best OJ we’ve ever had. The line moves quickly, so don’t hesitate to wait. They’re very efficient. Seating is limited though, and they accept take-away orders in a separate line. No wonder this place always has a line up, it's just that good. We had the shrimp oil pad Thai wrapped with egg, and we both agreed that it was one of the best (if not the best) padthai we have had in Thailand. Their orange juice (prices change everyday) is a must try! I am not exaggerating when I say it's the best orange juice I've had in my life. It's fairly big inside, so line ups aren't too bad. But there is a shorter line if you wanted to do take out. I visited Thipsamai during my visit to Bangkok! I must say this was some of the best Padthai I've ever eaten! Be aware that there is a long wait to get inside, however the wait is so incredibly worth it! The restaurant is very clean and spacious! Additionally, the food is very fresh,delicious, and cheap! I highly recommend!